WHO Task Group on Environmental Health Criteria for Dichlorvos.United Nations Environment Programme. ; International Labour Organisation. ; World Health Organization. ; International Program on Chemical Safety. Contains the collective views of the WHO Task Group on Environmental Health Criteria for Dichlorvos in Geneva on Dec. 1-5, 1986.; "Published under the joint sponsorship of the United Nations Environment Programme, the International Labour Organisation, and the World Health Organization. "; "International Program on Chemical Safety"--Cover. 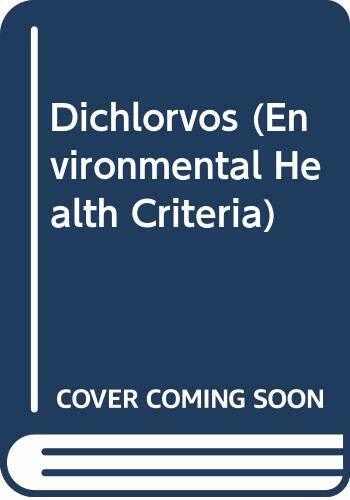 2 ^aWHO Task Group on Environmental Health Criteria for Dichlorvos. ^aContains the collective views of the WHO Task Group on Environmental Health Criteria for Dichlorvos in Geneva on Dec. 1-5, 1986. ^a"International Program on Chemical Safety"--Cover.